On Monday and Tuesday in Mexico City, political figures, academics, social scientists, security experts, and activists from at least six countries came together for the Winds of Change: Drug Policy in the World conference sponsored by the Mexico City-based Collective for an Integrated Drug Policy (CUPHID). Coming as Mexico's war on drugs turns bloodier by the day, the conference unsurprisingly concluded that current prohibitionist policies are a disaster. "The principal conclusion is that we need a more integrated drug policy based on prevention, scientific evidence, and full respect for human rights," summarized CUPHID president Jorge Hernandez Tinajero. "It remains clear that, yes, there exist alternatives to the current strategy." The so-called war on drugs has failed and, without doubt, we need "winds of change" to advance toward alternative policies to address the problematic of drugs across the globe. The prohibitionist paradigm has been ineffective, and furthermore, for the majority of countries it has implied grave violations of human rights and individual guarantees, discrimination, and social exclusion, as well as an escalation of violence that grows day by day, ever broadening the scope of impunity for organized crime. Drugs are never going to disappear. Thus, a more realistic drug policy should focus on minimizing the harms associated with drug use -- overdoses, blood-borne diseases like HIV/AIDS, and violence. This concept is known as "harm reduction," and must be the backbone of any drug policy. The conference opened Monday morning by putting its star power on display. 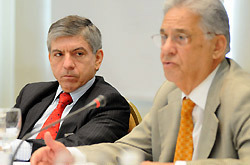 In its opening session, former Colombian President Cesar Gaviria, who, as a member of the Latin American Commission on Drugs and Democracy coauthored a report a year ago with former Brazilian President Henrique Cardoso and former Mexican President Ernesto Zedillo denouncing drug prohibition as a failed policy, returned to the theme. Noting that as president of Colombia in the 1990s, he had been a firm supporter of prohibition, Gaviria said he had changed his tune. "With the passing of time, prohibitionism, in which I believed, has demonstrated itself a failure," he told an attentive crowd jammed into a conference room of the Crowne Plaza Hotel in upscale Colonia Napoles. The attendant human rights abuses were a big reason why, he said. "You have to be very careful in the matter of human rights," Gaviria said. "The issue of militarization is so risky because militarization of the struggle against the drug trade, even though it may seem necessary and imperative at a given time, almost always veers into violations of human rights." Militarization is an especially prickly issue in Mexico, where President Calderon has deployed tens of thousands of soldiers in the war against drug trafficking organizations. While the military has failed to stop the so-called cartels or reduce the violence -- it has, in fact, increased dramatically since the military was deployed three years ago -- it has generated an increasing number of human rights complaints. According to the official National Commission on Human Rights, more than 1,900 complaints alleging abuses by the military -- ranging from harassment, theft, and illegal entry to torture, murder, and disappearances -- were filed in Mexico last year. Referring specifically to the Mexican situation, Gaviria added: "In the long run, one of the things that most delegitimizes public policies against drugs is when human rights are violated." Gaviria's comments sparked a quick reply from Deputy Carolina Viggiano of the opposition Institutional Revolutionary Party (PRI), who called Calderon's decision to send in the military "the worst mistake" of his administration and one that was likely to ruin the prestige of the Mexican military by the time his term ends in three years. While arguing that organized crime must sometimes be fought with extreme measures, such as anti-mafia laws and integrated counterintelligence operations, Gaviria also said that at some point, governments have to bring the traffickers in from the cold, perhaps by agreeing to let them plead guilty to offenses with short prison sentences. "Not 40 or 50 years in prison, but maybe eight or 10, and then the person can say, 'I'm done with this, I confess my crimes, I'll do my time, and that's that.' That is a solution with the justice system, not through militarization," he said. If Gaviria was looking for reconciliation with the traffickers, his co-panelist former Mexican Foreign Minister Jorge Castañeda was a bit more provocative. He suggested that Mexico needs to go back to the "good old days" of rule by the Institutional Revolutionary Party (PRI), at least when it comes to dealing with drug trafficking organizations. The PRI, of course, ruled Mexico in a virtual one-party state for 70 years before being defeated by Vicente Fox and the conservative National Action Party (PAN) in the 2000 elections. It was widely (and correctly) seen as not fighting the drug trade so much as managing it. Given the bloody mess that is the Mexican drug war today, perhaps it is time to return to a quiet arrangement with the cartels, Castañeda suggested. "How do we construct a modus vivendi?" he asked. "The Americans have a modus vivendi in Afghanistan," he noted pointedly. "They don't care if Afghanistan exports heroin to the rest of the world; they are at war with Al Qaeda." Castenada's comments on Afghanistan rang especially true this week, as American soldiers push through poppy fields in their offensive on Marja. The US has made an explicit decision to arrive at a modus vivendi with poppy farmers, although it still fights the trade by interdiction and going after traffickers -- or at least those linked to the Taliban. Casteneda also came up with another provocative example, especially for Mexican leftists in the audience. "We had a modus vivendi with the Zapatistas in Chiapas," he noted. "We also pretended they were real guerrillas with their wooden rifles. We created a liberated zone, and the army respected it, and it's still there. But it is a simulation -- the army could eliminate it in 90 seconds." And in yet another provocative comment on the theme, Casteneda suggested that somebody may already have arrived at a modus vivendi with the Sinaloa Cartel -- a suggestion that is getting big play in Mexican newspapers these days. "Why is it that of the 70,000 drug war prisoners in Mexico, only 800 are Chapo Guzman's men?" he asked. "Many people think the government has made a deal with the Sinaloa cartel. I don't know if it's true." The Mexican government was forced Wednesday to deny such claims, a clear sign they are getting wide circulation. Peruvian drug policy analyst Ricardo Soberon told the conference that while Latin America has been a loyal follower of the UN's and the US's prohibitionist drug policy discourses, it was time for something new. "The UN anti-drug paradigm is broken," he said. "We have to change the paradigm. We have to offer something other than prohibition and the criminal justice system, but what? A regulated market? What does that mean? What we need in any case are policies that are fundamentally based on human rights and deal with it from a public health viewpoint." Human rights and the drug war remained a key theme of the conference on its second day, with Luis Gonzalez Placencia, president of the Federal District (Mexico City) Commission on Human Rights, and Monte Alejandro Rubido, Subsecretary for Human Rights for the Secretariat of Public Security, speaking and being grilled by the audience. 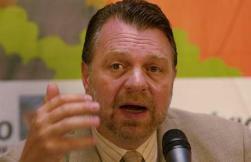 "The violent and militaristic policy against drugs generates more violence and has produced more dead," said Placencia. "We have to consider whether this anti-drug policy has become counterproductive," he added. But Rubido, a federal functionary, stood fast, saying the Calderon government remained firm in its commitment to keep drugs criminalized. Far from being a failure, the strategy is working, he said, to hoots and groans from the crowd. "It is achieving good results," he said. During a question and answer session that followed the pair, Rubido was raked over the coals by questioner after questioner, but remained stolidly unshakable in his support for current policy. "How many people has marijuana killed and how many has the policy of repression killed?" asked one conference-goer, but Rubido just smirked in silence. "People have consumed drugs forever," said Haydee Rosovsky, the former head of Mexico's national commission on addiction, from the floor, as she called out the bureaucrats. "You functionaries have to come out like Gaviria and Zedillo, and not wait until you are ex-functionaries." National Autonomous University of Mexico (UNAM) researcher Luis Astorga presented graphs showing which party governs which Mexican states and which coastal and border municipalities and how they appear to be affiliated with different blocs of cartels. "The PRI governed states on the Gulf Coast are where the cocaine flows," he said, "and the PRI controls most border municipalities." That is the province of a bloc of cartels consisting of the Gulf (los Zetas) and Juarez cartels and the Beltra Leyva breakaway from the Sinaloa cartel, Astorga suggested, while taking pains to say his research is only "a work in progress." On the other hand, the ruling National Action Party (PAN) controls the northwest states of Baja California, Sonora, and Sinaloa, playground to the Sinaloa, and La Familia cartels, and breakaway factions of the Tijuana cartel. Echoing Casteneda, Astorga suggested it might be time for a "pax mafioso," although he admitted it would be difficult to find political cover for such a move. Ethan Nadelmann, head of the Drug Policy Alliance briefed the crowd on the US medical marijuana experience at event organizers' request, although he expressed bemusement at the issue's relevance to Mexico and its drug war and labored to make a useful connection. "Medical marijuana provided the angle of attack that broke the marijuana policy logjam in the United States," he noted. "What Mexico needs is to find some sort of similar issue, some sort of similar angle. Perhaps the best approach is to argue that by legalizing marijuana we can deprive the cartels of a significant income stream," he suggested. The Mexico City conference this week is just one more indication that the cracks in the wall of drug prohibition in Latin America are spreading. But while the drug reform movement in the hemisphere has some big names behind it, it is still going to take on the ground, grass roots organizing in countries across the hemisphere to move forward. The conference in Mexico City helped lay the groundwork for that, at least in Mexico. There is only one way to end the violence associated with the drug trade - total legalization of all drugs. Anyone who has a legal right to buy and consume deadly tobacco and alcohol MUST have the right to grow and use marijuana without fear of prosecution or persecution by anybody. If amphetamines were again made available in drug stores by prescription, crystal meth would go away by itself. Let big pharma manufacture the other popular drugs and sell them for REASONABLE prices (not black market prices) then when the bad guys run out of bullets, it's over. No more drug related violence: no more corrupt cops, judges, attorneys and politicians: and the consumers would have plenty of cash to spend on the open market, which would benefit everyone. At the very least, we could finally count the number of people using drugs. Then we get the farmers growing all the hemp possible. It sits in the field all summer sucking CO2 out of the air and producing more oxygen than any other plant of comparable size. At the end of the growing season, we make ethanol from the leaves allowing us to feed our corn to the cattle to produce beef that poor people can afford again. The seeds are very high in amino acids and the stalks make the strongest natural fiber known. "If amphetamines were again made available in drug stores by prescription, crystal meth would go away by itself." Amphetamines, including methamphetamine, are already available in drug stores by prescription. I fill a prescription for dextroamphetamine every month. Amphetamines are prescribed for narcolepsy, ADD, and ADHD. I haven't read anything about crystal meth going away. You should know that the DEA has influenced the availability of prescription drugs, in this country, as well. They started when they, rounded up, and arrested, many doctors after it became illegal, overnight, to prescribe "heroin" (diacetyl morphine), way back when, to their patients. In the case of amphetamines, some states demand a pre-approval, or it could get you in trouble! Not really, very, available, now is it? And, how many articles are out there, trying to outguess the doctor who decides to treat the ADD, or ADHD, patient because of the drug they choose. There is always another doctor willing to say you were using it improperly! That is the nature of medical competition! They also tell the doctors that this substance, (class 2, amphetamines, pain pills, cocaine) if prescribed or used more than they think it should be, will get the doctor arrested for being a drug dealer! Deny that has a chilling effect on prescription habits! So, acting like the present system would affect the availability of illegal meth, is moot. The supply is still artificially restricted and not a matter of free markets. It is not surprising that you do not see crystal meth going away. But, the supplier has shifted to the south of the border! And since it is a black market, there are many greedy people, out there, that will figure out a way to get rich from it! Decrease the supply and the,continued, demand means there is more money is to be made! We have left the "control" in the hands of the dealers by making it illegal. Don't we know what their idea of control is?! The purity of the Ritalin, a patient might be prescribed, is known. But, that home made junk is full of other stuff that can kill you. So, we force people to use the only drug available to them, for relief of their symptoms, when it could kill them? Do "we" have the moral high ground? and methamphetamines are much less dangerous than alcohol or tobacco; why shouldn't they be available over the counter? The aim of prohibition is, and always has been, to oppress certain minorities and certain classes of people. Nor has the so-called 'war on drugs" failed in its goal to arrest and incarcerate as many people as possible to further the careers of self-serving politicians. Oh, the war certainly has failed to meet its stated objective, which is to reduce the demand and the supply of certain drugs. But knowing that drug warriors lie about everything else; why would anyone believe them about their real objective? Only by pretending that the drug warriors are telling the truth about their stated objective can you possibly pretend that they've failed. Myself, I know only one thing the warriors say is true: That they're winning the war. If you'd ever experienced the tender loving care of America's travesty of justice system, you'd know it, too. Why isn't MMJ an "angle of attack" in Mexico like in US? Most Mexicans are far less able to afford big pharma's products, so the need for a cheap and effective medicine like cannabis is far greater than here. But there doesn't seem to be much of a push for it, as far as I know. Answer, at least for the past, might be: No citizen right to referendums.